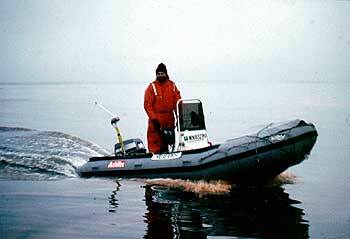 Outboard motors are found on small boats that are popular in coastal waters. The propeller of an outboard motor is what creates sound. On smaller boats, like a zodiac, the small propeller produces a cavitation noise which is at higher frequencies than larger vessels. The smaller propellers also produce higher rotation rates which also causes the propeller to make higher frequency noises. A zodiac, for example, can produce frequencies as high as 6300 Hz.